For the past 18 months, Avedøre Power Station has been converting its coal-fired power station unit, and the entire combined-heat-and-power plant is now able to produce electricity and heat based on wood pellets and straw, rather than coal and gas. 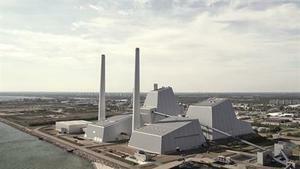 “Following the conversion of unit 1 at Avedøre Power Station, we can produce heat for more than 215,000 Danish households in the Greater Copenhagen area without using coal or gas. The conversion is a major contribution to achieving a green district heating system in the Greater Copenhagen area as well as a green electricity system, supplementing solar and wind power,” says Thomas Dalsgaard, executive vice president at DONG Energy.